I love this twist on beef stroganoff! Tender egg noodles and wonderful meatballs in a rich savory gravy. Oh my! Such yummy comfort food! Mix all ingredients together in a large bowl along with a half cup of the beef gravy. Add more breadcrumbs as needed for the right consistency. Shape into 1 1/2-inch meatballs, forming about 24 meatballs. In large skillet, melt olive oil and then add butter. Add meatballs in batches and fry on all sides over medium heat until all sides are browned. Transfer to a paper towel-lined plate. Repeat until all meatballs are browned. When finished, drain off excess fat from skillet but do not wash or clean the pan. Melt 1/4 cup butter in the skillet and stir to make sure you blend the pieces of beef and onion and garlic left on the bottom. Using a whisk, quickly whisk in flour and cook for about one minute or until very lightly browned. Homestyle Savory Beef Gravy. Stir in sour cream; season with salt and pepper, to taste. 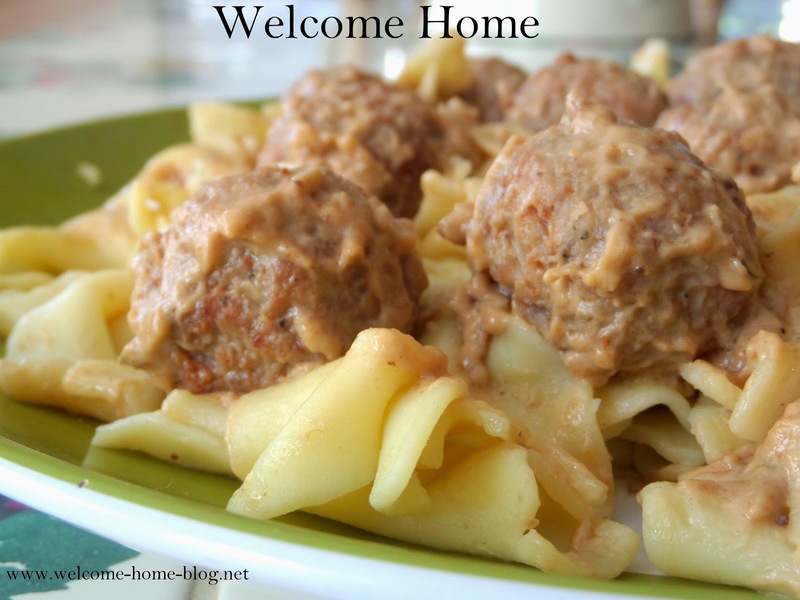 Add meatballs back to skillet and cover. Simmer on low heat for about 30-40 minutes. In the meantime, cook egg noodles as directed on package. Drain well and add to platter. Serve meatballs and gravy over hot egg noodles.